Our Cycle of Life contains stellar points of light to be shared and celebrated. ReBahir can enhance these meaningful moments. By sitting in council with you, ReBahir will develop a finely tailored ceremony filled with a gentle, creative approach to tradition while meeting your individual needs. ReBahir can enhance any cycle of life event, making them even more memorable and inspiring. He can help you bring tradition alive in a personalized, distinctive style for your family. Birthing is magical. And when a child is born, we, as parents are offered a sacred challenge. As a symbol of welcome into an ancient tribe, each moment is a mystical opportunity of sacred connection. Together we will sit in council and share our traditions and our modern sensibilities. Together we will create a memorable meaningful ceremony of entering into the Tribal covenant of the Jewish people. Hebrew names are spirit names filled with dreams and hopes for future. They joyously recall our tribal past. Hebrew names honor ancestors; the challenges they faced and the teachings that they shared. They can touch the soul and point to purpose. Hebrew names influence the person who wears the name. They become a golden link in the chain of family love and life. Sit in council with ReBahir as you choose the spirit name that will live in the soul of your future. What do you remember of your Bar/t Mitzvah? Do you remember your Torah portion? Do you remember the personal meaning that was hidden in that portion? And, how do you remember your Bar Mitzvah studies? For over 30 years, ReBahir continues to develop a process of study that has his students engaged and eager to study, not just to party. His methods, energized with fun and meaning, stimulate students to become willing participants partnering in the process. ReBahir’s method is not the rote recitation of words the student does not understand. The process he develops for each of his students is personalized and powerful. Students find and express their own meaning in the words that they will recite. Torah becomes a personal, poignant guide. Not only does the student prepare for her or his Bar/t Mitzvah, the student and parents plan the ceremony with ReBahir. 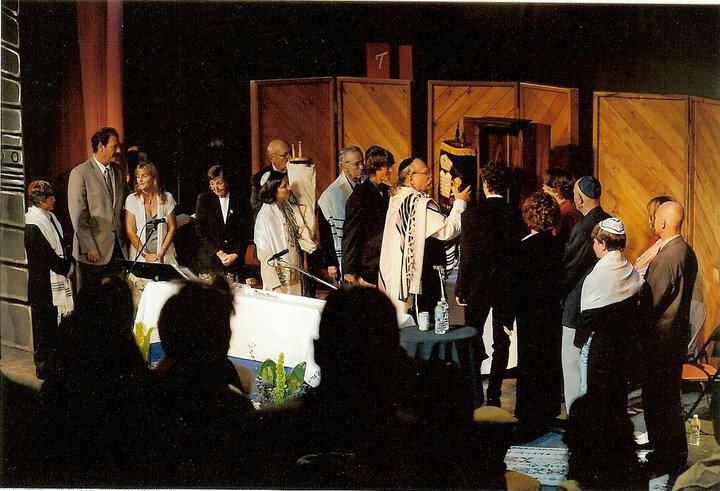 The Bar/t Mitzvah becomes a personalized ritual expression of the learning that has been shared. How can ReBahir assist you if you do not live in his area? ReBahir can ‘meet’ you via computer meetings, phone meetings, skype, intensive workshop time as well as face-to-face meetings. There are many Rabbis who will counsel people. ReBahir, does not counsel. ReBahir ‘sits in council’ with all who come to him. ‘Sitting in council,’ does not mean giving glib answers to deep questions. It means caring and it means sharing paths to personal and spiritual fulfillment. To sit in council is to flow in the moment, to be aware of personal challenges and to be engaged in the exploration of individual, personal spirit direction. Mazal and Bracha!! Congratulations! You are getting married! A wedding is a turning point, a joining point for a couple. It is important to have a caring and sensitive Rabbi to advise and to share in the planning and realization of your wedding. ReBahir is a multi-dimensional, multi-faceted Rabbi who works with couples from all movements in Judaism, couples of different faiths and with couples of all sexual orientations in the role of ‘councilor’ not as performer or as authority figure. ReBahir will sit with you in council and help you plan a beautiful and meaningful wedding ceremony. Every wedding is a unique experience. ReBahir will craft your wedding into a personalized and powerful experience. When two people marry there is a striving. A striving to become Partners, Lovers, Friends. At times the path is strewn with Klipot, sharp shards that cut and bruise the process and injure us on the way. But hidden within each sharp shard, we can discover a sacred light that brings us closer to each other and to G.
Sitting in council sheds light on the shards of our lives. And through that council, we discover with our loved one, a path to unity. Sometimes we grow together; sometimes we grow apart. When a time of parting comes, it should not be a time of rancor, carrying self-destructive baggage. The conflict of separation can be an opportunity for inner growth, an emotional and spiritual release. The Jewish Get (writ of divorce) is a process of unburdening and emptying, so that we may refill our cup from the waters of life. Rocky Mountain Hai offers a unique opportunity for people who desire to free themselves emotionally and spiritually from a marriage that is no longer healthy and happy and hope-filled. When the bonds of matrimony have become limiting chains of constraint, come to the living mountain, Rocky Mountain Hai. We will sit in council as we gently release the bonds that keep our souls from soaring. is that it not only has a beginning but it has an ending. And yet that ending is also another beginning. But as the poet says, “Whenever passing comes, it comes too soon.” There are times in life when we must be strong. The passing on of a loved one is not one of these times. When the time of passing comes for a loved one, Rocky Mountain Hai is here for you. ReBahir will sit with you, not to comfort (for that only the power of time can confer) but simply to be there with you for your needs during your time of challenge. ReBahir will gently share a service of the heart and share in the questions of the heart as the circle of life continues even as we strive to learn to accept the unacceptable.